FILE PHOTO: U.S. one hundred dollar bills are seen in this picture illustration, August 2, 2013. 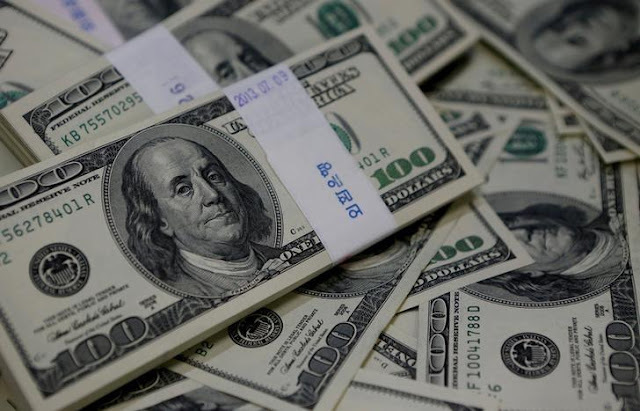 NEW YORK - The dollar jumped to more than two-month highs against the yen and seven-week highs against the euro on Friday after the government’s jobs report for September showed rising wages. Average hourly earnings increased 12 cents or 0.5 percent in September after rising 0.2 percent in August. The gains came as nonfarm payrolls fell by 33,000 jobs last month after Hurricanes Harvey and Irma left displaced workers temporarily unemployed and delayed hiring. “I think most people realized going in that the headline numbers would be distorted because of the storms, but the surprise was the average hourly earnings,” said Win Thin, head of emerging markets currency strategy at Brown Brothers Harriman in New York. The greenback jumped as high as 113.41 yen, the highest since July 14. The euro fell to as low as $1.167, the lowest since Aug. 17. Interest rate futures traders are now pricing in a 93 percent likelihood of a December rate hike, up from 84 percent on Thursday, according to the CME Group’s FedWatch Tool. The dollar jumped to more than two-month highs against the yen and seven-week highs against the euro on Friday after the government’s jobs report for September showed rising wages.